I'm sure that there are some very good reasons for this church being locked without a keyholder. What the reasons are, though, is beyond me. Here we have a large church in its well-kept graveyard, surrounded by prosperous modern housing. Surely there must be some demand for opportunities for private prayer? Or perhaps I just came at a bad time. Maybe times other than 10 o'clock on a sunny Spring Saturday morning, this place is a hive of spiritual activity. 19th century opulence against a 13th century tower. St Peter benefitted from a wealthy rector in the late 19th century, who had the church almost completely rebuilt at his own expense. 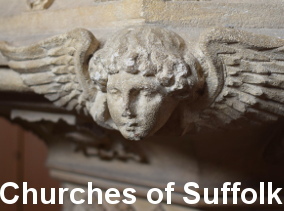 It is easy to be sniffy about this, but we need to remember the dereliction of many churches, particularly in this part of East Anglia, by the 19th century. Also, in those days before Lowestoft reached out and engulfed it, this church was isolated in the fields. But here was a vicar with vision, who restored it thoroughly, so that future generations could use it - or, at least, they could if it wasn't kept locked. The tower is the original 13th century one, restored rather than replaced; the rest is all 19th century work. But it is still a fine building; the interesting looking south transept is apparently an organ chamber, and several of the old windows were reused. Apparently, the church contains a picture of itself before the rebuilding, and Mortlock assures us of large quantities of very good 19th century glass. But that is more than I know. St Peter, Carlton Colville, is located on the western edge of Lowestoft, on the road to Beccles. Locked, locked, locked.